Garlic mustard was introduced from Europe in the 1800's for both food and medicinal use. The plant has a prolific growth rate and can produce hundreds to thousands of seeds per plant. It can easily double its plant population in a single year, creating monoculture stands that crowd out native species. Garlic mustard is a biennial plant; its first year is spent as a basal rosette, with leaves that remain low to the ground. In its second year, the plant shoots upward ("bolts") and will flower, typically in late spring. 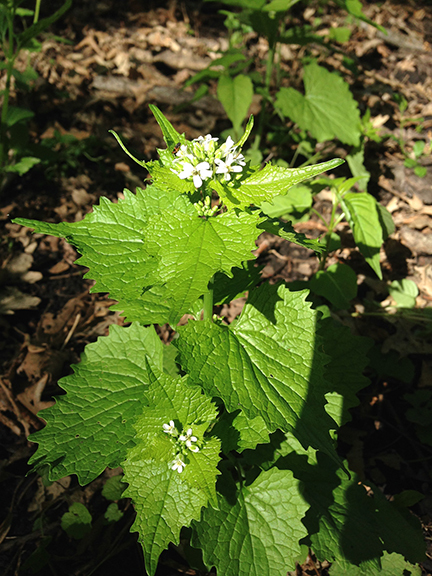 Stands of garlic mustard can cover forest floors, threatening the native wildflowers and other herbaceous plants. Wildlife relies on these native plants for food and habitat and, their declines can have cascading effects on overall ecosystem health. Garlic mustard is a disturbance-adapted plant, so methods of removal that cause disturbance, such as mowing, should be avoided as they will only aid the plant's production. For this reason, simple hand removal is the best method for small-scale infestations. FMR staff provide a brief training on the easiest removal method at the beginning of each invasive species removal restoration outing, which are listed on the FMR event calendar and in the FMR e-newsletter, Mississippi Messages. 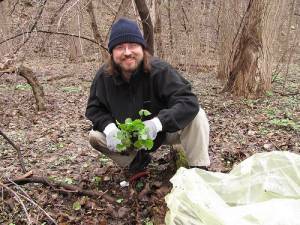 When hand-pulling garlic mustard plants, timing is key. It is important to remove the plants before they are able to go to seed. Volunteers are careful to remove the upper portions of the roots along with the stem. Buds grow in the top segments of the root, so if not removed, additional stems can reproduce. To eliminate leftover roots with potential re-growth capabilities, event volunteers try to remove all of the garlic mustard plant roots, if possible. Damp soils make the removal process even easier. Responsible disposal is vital to prevent unintentionally distributing the seed of the plant. Pulled plants are bagged and removed from the site, as seed ripening persists even after the plant has been removed from the ground. Once removed, the plants are typically destroyed (often burned) by park staff or other professionals. Unfortunately, one removal is never enough. Garlic mustard plant seeds remain viable in the soil for up to five years. The long-lasting viability of the seeds requires revisiting the site and applying additional efforts at least once a year. This persistence is essential to reduce or eliminate the invasive threat. Eventually, after several years of revisiting the same site, if properly done, volunteers can ensure that the garlic mustard seed bank will be exhausted. Only then will seedlings cease to reappear. 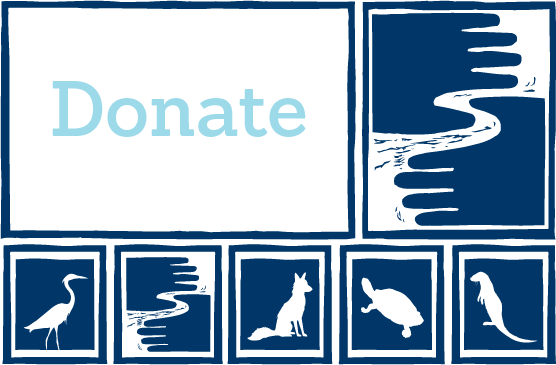 Whether participating in one active effort of mustard seed removal or committing yourself to continual visits to the same site, volunteers like you have led to very significant progress at several FMR stewardship restoration sites. Our continued efforts returning to the same sites have made a noticeable difference, allowing our focus to spread to further reaches of the worksites. 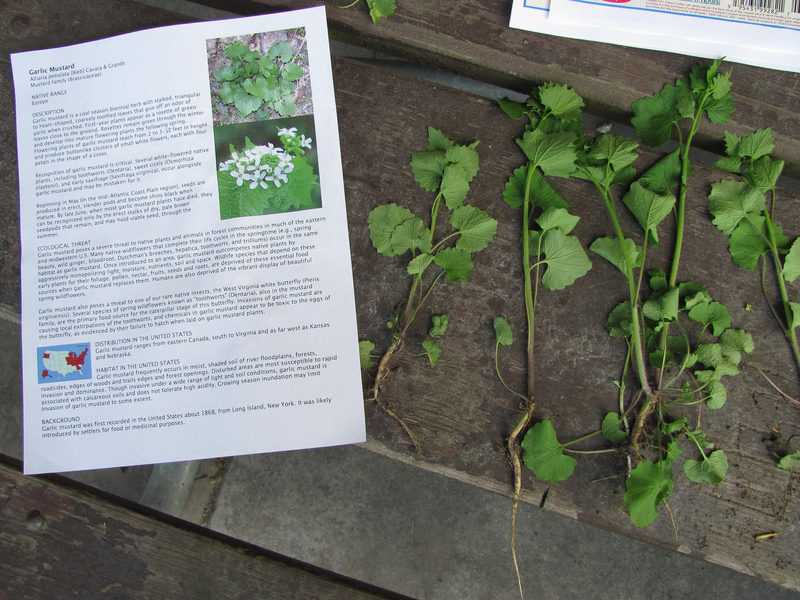 Additional information on garlic mustard is also available from the Minnesota Department of Natural Resources.